The colour is russetmuscat and the nose is punchy and very closed first. After some time of breathing it offers rather floral-flowery aromas instead of the expected fruits of the wine cask (that lurk shy in the background). Some water opens up the nose, actually I would say a reduction is essential on this dram. Now some fruits dare to enter the spotlight together with stronger wooden notes but still this stays a rather uninteresting nose. Where are the malt aromas? The taste is rather locked and shy too as was the nose but after some chewing it releases a simple malty-winey profile in a heavy oak setting. Some fruits, some chocolatey notes and some spices - this is not bad but not great either. Easy to sip, not more. Water turns the taste smoother but unlocks no additional flavours, unfortunately. I like this dram best when reduced to about 46% abv. 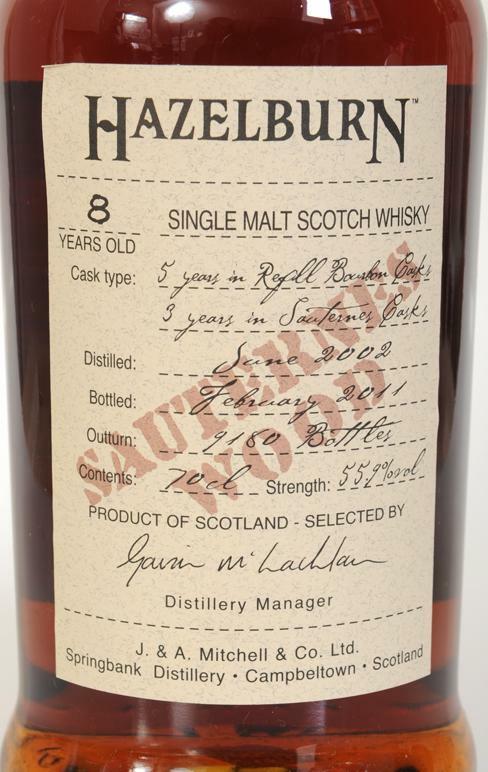 The dram arrives warming and somewhat coating on the palate with hot peppery moments due to the cask strength abv. The finish is of a medium length and adds no new impressions beside a drying-astringent ending (tobacco ashes, tannins). Water increases this with a slightly bitter-cardboardy note (aspirin in a wet box). I have to improve my opinion about Hazelburn. I rarely discovered so much in a whisky. Above all, the influence of water causes miracles, which affects the overall impression. You could have filled it with about 50%. Great whisky, a spectacle of tastes and smells, just the Brazilian carnival, good with both water and without. Open, wet, spicy wood, old furniture, cigar box, pipe tobacco, leather goods, fruit jam, dried fruit, cappuccino, milk chocolate, fruit tobacco for hookah, sweet creamy notes, baked milk, fudge. Saturated, powerful, tart spicy oak, sweet wine, fruit notes, cream and confectionery tones, candied fruit, a little pepper, earthy notes, prunes, dark beer. Continuation of taste, dense, rich, sea of ​​fruit, dried fruit, confectionery and wood shades, sweet creamy notes, latte, chocolate. Without a doubt, it's not a bad whisky. It's just a little boring. The spicy side that comes into play in the palate is the positive side in this case. Appearance: slow thick legs, coating. Very winey, with dried fruit, sugar, and moist wood. It's not really expressive. Behind that, there is wafer with syrup, some caramel. With water, grape seeds and grapes. Still, rather onedimensional, but nice. The taste is not as sweet as the nose suggests. It's musty, which is positive, and it probably comes from the cask. Further, spices come into play, which is positive. It gives this dram a stylish character. Otherwise, it's the dried tropical fruit. Rather long and balanced, not too sweet and certainly not drying. It has a combination of sugar, dried fruit and spice. 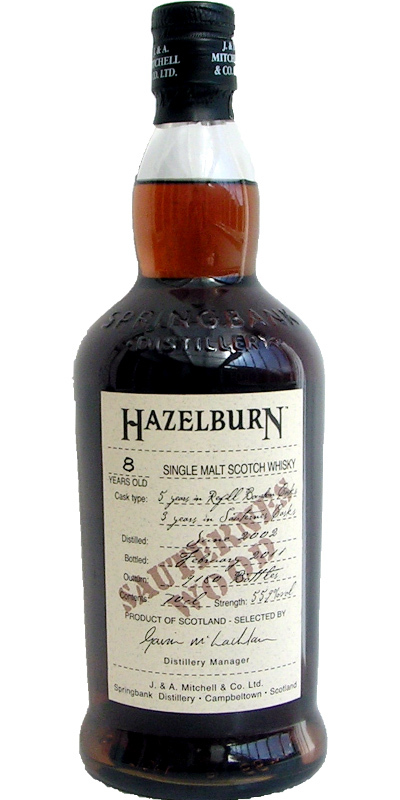 Clearly Hazelburn with a red fruit twist. There is the salty ashy taste, but also forest berries. It needs a bit water to tame all the alcohol, but first impressions are good. With water: There is an initial sourness added, but not much of a change here either. Medium length. Very much into the red fruit. Nicely fading away with some toffee and caramel. It get's a bit dry in the end. Don't know, this was a sample.